St. Scholastica will begin its 106th year next week with traditional Welcome Weekend activities, while a start-of-school Convocation Ceremony the following week will welcome students and faculty back to campus. The College expects to welcome its largest freshman class in at least five years. St. Scholastica's Move-In Day, geared toward first-time freshmen, will take place starting at 9 a.m. on Friday, Sept. 1. The College's orientation team members, a group of students called Team Delta, will be on hand to greet students and assist with the move-in process. -move-in and check-in for new students and their families from 9 a.m. to 2 p.m. in Somers Hall. The Convocation Ceremony will be held at 10:45 a.m. Thursday, Sept. 7 with a procession led by members of the College's Heritage Club, comprised of alumni who graduated at least 50 years ago. They are escorted into the College's Mitchell Auditorium by current students, and are followed by faculty dressed in academic regalia. Bagpipers provide music for the procession. Incoming freshmen will be officially welcomed to St. Scholastica during this event, which will include an address from Dr. Gina Diaz, assistant nursing professor and recipient of the College's 2017 Max H. Lavine Award for Teaching Excellence. At the conclusion of the ceremony, which will last about an hour, faculty and staff line the hallways of Tower Hall to cheer and clap for the freshmen as they exit the auditorium. 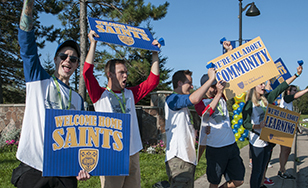 St. Scholastica expects to welcome about 495 new freshmen to campus this year. It's the largest incoming freshman class in at least five years, according to Jim Miller, interim vice president for Enrollment Management. Enrollment numbers won't be finalized until after classes have started.